I overslept. I had planned to start the ride at sunrise and try to reach Hongsa in the afternoon to join day 2 of the elephant festival. I found out about the festival only after I had booked my air tickets. If I had known, I would have flown in 1 or 2 days earlier. With yesterday’s delay, I was not sure if I could still make it to the festival on time. You would have noticed that despite the doubts I had yesterday, I had decided to continue with the motorcycle tour. Returning to Vientiane via the same route did not sound attractive to me. I would try to be more careful from now on. I would look for a spare tube and before then, stick to better roads if possible. I moved off at 730am. Along the way to Xanamkhan, I noticed logging activities. 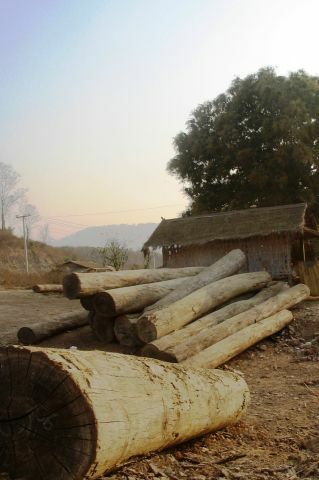 Illegal logging is a problem in Laos. For the promise of good money, locals have turned to chopping down trees and selling them to Thailand and Vietnam. Maybe to them, what’s the environment when you are hungry? The roads remained unpaved until Xanamkhan. From Xanamkhan to Paklay, I met elephants herders on the roads. Little did I know at that time that I was not going to make it to the elephant festival and these were the only elephants I would see in Laos. 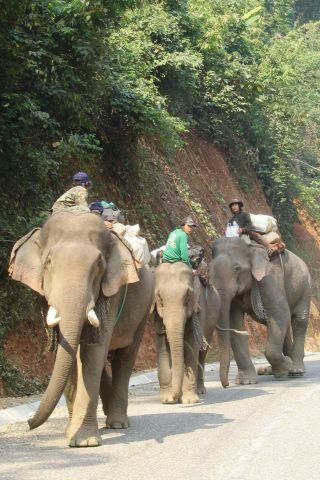 Talking about elephants, did you know Laos is also known as the Land of the Million Elephants? 40km before Paklay, the roads turned winding and tarmac. There were even kilometer stones. My mood turned better and it was a joy riding the roads. 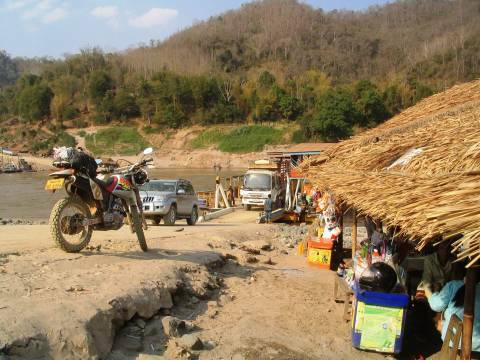 I soon reached the Mekong river where I had to take a ferry to reach Paklay. I paid 30,000 Kips for the crossing. At 10am, I found myself at Paklay. From Paklay, it was a long ride to Xayaboury on unpaved roads again. I reached Xayaboury at 2pm with sore bums. I had been riding for about 6 hours without any food. It was tiring and I wondered why I was doing this. I couldn’t think of any good reasons and decided that I must be masochistic. I turned left at the junction to Hongsa. After 1km on bad roads, the engine suddenly stopped. I revived it after a few attempts. But my confidence had waned. I relooked at the maps. I calculated that I would take approximately 2 1/2 hours to travel the 90km road to Hongsa. Assuming I didn’t get into any mishaps, I might just be in time for the closing ceremony of the festival. Disappointed, I u-turned to Xayaboury and took the right fork to Luang Prabang. After 27km, I reached the dock at Tha Deua where I had to cross the Mekong river once again. I found out that my bottle of engine oil had leaked, leaving a mess in my pack. I cleaned up as best as I could. While waiting for the ferry, I bought some drinks from the vendors. After a rather long wait, I paid 20,000 Kips to cross the Mekong river. The roads turned sandy after I crossed the river. Sands is my nemesis. 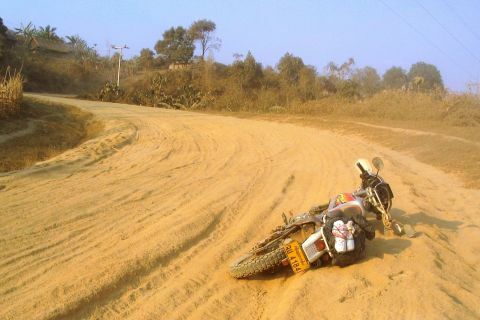 I fell two or three times at the Death Highway in Cambodia. This time in Laos, I fell once. I passed by local villages where women were taking late afternoon baths in their sarongs (a piece of garment wrapped around the body). It’s funny that I did not see any men. Maybe they were still at work and bath at different times. Route 4 soon joined Route 13. 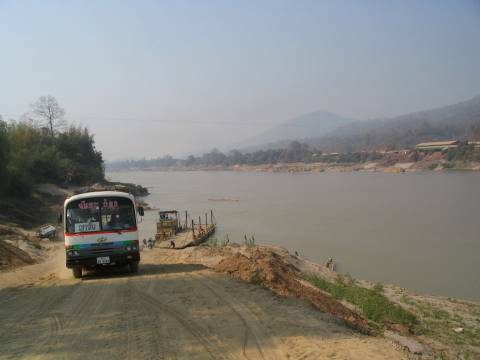 The 24km stretch on Route 13 to Luang Prabang was very excellent and I made good time at 70km/h. I reached Luang Prabang at 6pm and circled the town a few times for a guesthouse. There were many guesthouses to choose from. I ended up at Saysamore Guesthouse which faces the Mekong river. I splurged on a US$12 room with a private bathroom so I can clean my dirty stuffs. At night, I visited the handicraft market where there were Hmong clothings, paintings and other sourvenirs for sale. There were many other tourists at the market and at the handful of pubs and cafes located by the street. I turned to the quiet Somchanh restaurant where I ordered fried chicken with yellow noodles to pacify my growling stomach. I salivated at the thought of biting into juicy and crispy deep fried chicken cooked in KFC’s style. Alas, fried chicken turned out to be stirred fried chicken. Well, at least it was delicious. On the way back to my guesthouse, I bought some deep fried coconut and bean puffs at 1000 Kips each from the street vendors. This entry was posted in Laos, Motorcycle Adventure Vacations and tagged Elephant Festival, Hongsa, Luang Prabang, Paklay, Xayaboury by atticus. Bookmark the permalink.